Home / Current Events / LVCIC hosts A Weekend Of Cannabis Knowledge January 17th & 18th, 2015! 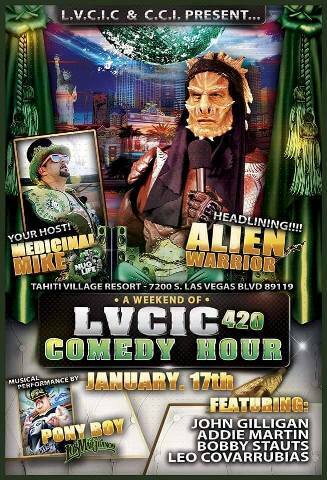 LAS VEGAS, NV – Las Vegas Cannabis Info Center teams up with Cannabis Career Institute to host A Weekend of Cannabis Knowledge at The Tahiti Village Resort January 17 & 18, 2015. Saturday the 17th from 4-10 PM will be a Free Networking Mixer with a Special Guest Appearance by former Governor of New Mexico, Gary Johnson. An entire day of paid curriculum seminars on Sunday, January 18, 2015, will cover topics such as: Dispensary Management, Legal Issues, Marketing and Advertising, Marijuana Cultivation, Cooking With Cannabis, And More! The seminars are designed for anyone interested in a sustainable career in the Cannabis Industry or personal connoisseurship. World renowned CCI instructor Robert Calkin will be teaching amongst instructors that include Registered Nurse Julie Monteiro of Ask Nurse Juhlzie, attorney Bruce Gale, published author and Cannabis Chef Cheri Sicard, T-Weed Edibles, Growmaster Cultivator Ken Hoffman, Molecular Bioscience & Bioengineering Specialist JP, Tim Rouge of Canna Connection, Stephanie & Bill Shehan of Vegas Cannabis Magazine, Bruce Perlowin, and surprise guests. Robert Calkin’s opening session on Compliance in Starting a Legal Marijuana Business will be open to all credentialed press from 9 – 10:30 AM on Sunday, January 18, 2015. No photographic recording devices will be allowed in any of the other sessions. The industry networking mixer will take place on Saturday, January 17, 2015, at the Tahiti Village Resort from 4 PM – 10 PM. Medicinal Michael of NugLife Radio will host an evening of Comedy and Live Acoustic Music that will include comedians Alien Warrior from Last Comic Standing, John Gilligan, Bobby Stauts, Dat Dude Donnie, Leo Covarrubias and celebrity daughter, Addie Martin alongside performances by Kella Bo Bella, Ponyboy of Los Marijuanos and surprise guests. Vendors, Sponsors, and represented organizations will include Las Vegas Medical Marijuana Association, Getting Legal, Greenspot Hydroponics, Hemp Inc., Vegas Cannabis Magazine, Wondersoil, Hippie Livin Smokeshop, Red Dragon Brothers, Ace Analytical Labs, and a special appearance by Cannabis Sativa President and CEO, Gary Johnson. The former Governor of New Mexico was the first mainstream political figure to advocate legalization of marijuana and has recently been featured in Forbes as an example for other marijuana firms to emulate. One lucky Grand Prize winner of the raffle at the LVCIC networking mixer (must be present to win) will receive a $299 scholarship to the next days’ seminars, from 9 AM – 6 PM on January 18, 2015. The LVCIC Saturday industry networking mixer is free admission to the entire 21 and over Las Vegas Cannabis Community. 10% of all raffle proceeds will be donated to National NORML. Las Vegas Business owners, residents, and Tastemakers in the hotel, casino, tourism, and Cannabis industries, are invited to enjoy Food and Drink Specials, and FREE Live Entertainment; while celebrating Knowledge and sharing information.